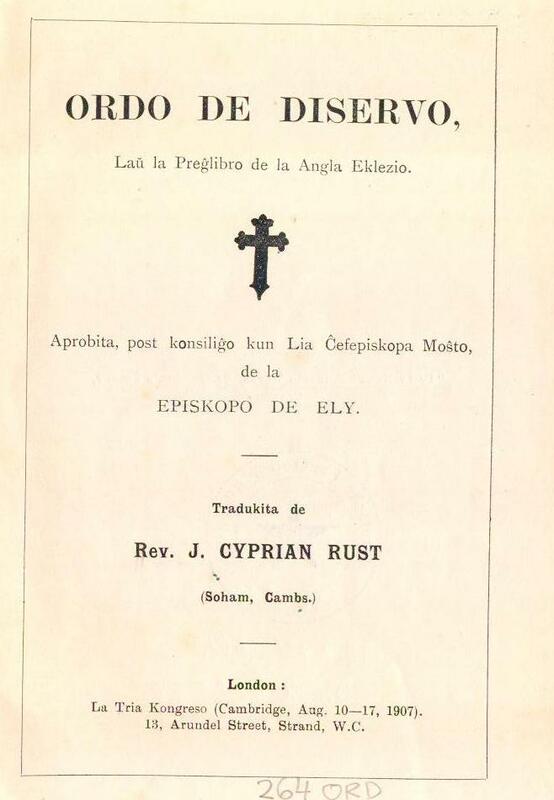 This order of worship was published (with Anglican episcopal approval) in Cambridge, England, in 1907, for use in Christian worship during the Third World Esperanto Congress (Universala Kongreso de Esperanto), which was held in Cambridge that year. Tiu ĉi Ordo de Diservo eldoniĝis (kun anglikana episkopa aprobo) en Kembriĝo, Anglujo, en 1907, por uzado en Kristana adorado dum la Tria Universala Kongreso de Esperanto, kiu okazis tiujare en Kembriĝo. Thanks to a diligent bit of scanning on the part of Karl Heinz Schaeffer of the Deutsche Esperanto-Bibliothek Aalen, I am able to present it here. Following the order of worship there is a supplement containing 26 song texts (and one tune), which constitutes the earliest published Christian hymnal in the International Language. (The hymns without tunes are, for the most part, outfitted with references to appropriate hymn numbers in Hymns Ancient & Modern for those who may require musical notation.) Enjoy! Mi metos la skanaĵojn (po ses) en tri apartajn afiŝojn sekvontajn. Dank’ al diligenta skanado fare de Karl Heinz Schaeffer ĉe la Germana Esperanto-Biblioteko en Aalen, mi povas prezenti tion ĉi ĉi tie. Post la Diserva ordo sekvas suplemento enhavanta 26 kantotekstojn (kaj unu melodion), kio konsistigas la plej fruan eldonitan kristanan adorkantaron en la Internacia Lingvo. (La himnoj sen melodioj, plejparte, portas resendojn al taŭgaj numeroj en la himnaro Hymns Ancient & Modern por tiuj, kiuj eventuale bezonos muziknotojn.) Ĝuu! I’ll be putting the scans (six apiece) into the three following posts. This entry was posted on Julio 2, 2010 at 7:24 ptm and is filed under Uncategorized. You can follow any responses to this entry through the RSS 2.0 feed. You can leave a response, or trackback from your own site. Scott Wells has an OCR’ed version on his blog, Boy in the Bands.